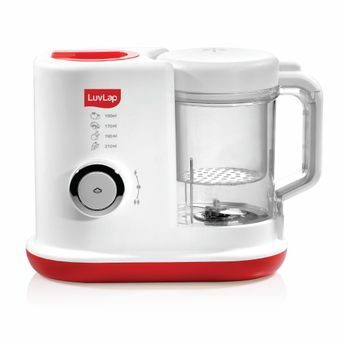 Make easy and fast meals that are equally nutritious and safe for your baby with LuvLap Royal Steamer Blender. This multifunctional food processor steams and blends the food according to your requirement. This appliance designed to make the baby meals fast and easy, retain the water extracted from the vegetables during steaming in the jar and combines it with the blend of food, preventing any loss of nutrients. Retains nutrients: Water extracted from vegetables during steaming is retained in the jar and combined to blend the food. This prevents any loss of nutrients.